When you get married, you pledge to stand by your spouse “in sickness and in health.” That’s a great way to maintain wedded bliss. But it’s a lousy strategy for investors. Instead, when the market starts getting sick, you can’t just stand by your old investments. You need to change strategies — fast — in order to inoculate your portfolio against the threats that lie ahead! That’s what I got to thinking earlier this week as the Italian bond market imploded … again. The year on the 2-year Italian Treasury Note soared a stunning 170 basis points (1.7 percentage points) on Tuesday in just a few hours. They’ve now swung from NEGATIVE 0.15% in mid-May to as high as 2.83%. How crazy is a move like that? It’s like what would happen here in the U.S. if the Federal Reserve hiked interest rates seven times by 25 bps each … IN ONE DAY! So far in this rate-hiking cycle, the Fed has only raised them six times — and taken 29 months to do it. What the heck is going on? Italy’s President Sergio Mattarella refused to accept the candidate for economy minister that a coalition of political parties offered up. He said the minister, Paolo Savona, was too much of an anti-euro guy, and that his nomination would cause turmoil in the European debt, stock, and currency markets. But by defying the overall will of the Italian people, more than half of whom voted for populist political parties in March elections, Italy’s president is playing with fire. His move ensures the political chaos in Italy will drag on for weeks, if not months. And the ironic thing is his refusal brought about the very market turmoil he hoped to prevent! But what’s happening here is much, much more important than many investors realize. It’s about so much more than the level of Italian interest rates. Think back to the first phase of the so-called “PIIGS” crisis in 2011-2012. The acronym stood for the names of the European countries at the heart of the crisis — Portugal, Ireland, Italy, Greece, and Spain. European Central Bank President Mario Draghi pledged to do “Whatever it takes” to “fix” it. The ECB began massively intervening in European markets, buying up trillions of euros worth of government bonds, and launching multiple programs designed to flood the economy with cheap, easy loans. But the recent turmoil proves he didn’t fix anything. All he did was temporarily paper over the problem by artificially inflating European bond prices and artificially suppressing interest rates. Excessive debts weren’t written off. Reckless banks weren’t allowed to fail. Governments weren’t punished for enacting fiscally irresponsible policies. The underlying illness only grew worse. Now, Italy owes about 2.26 trillion euros ($2.63 billion) in government debt. The combination of that huge debt load and its stagnating economy has driven Italy’s debt-to-GDP ratio to a whopping 132% — second only to Greece in the eurozone! Furthermore, it will have to “roll over” more than 150 billion in debt each of the next three years as old bonds mature. That process will get prohibitively expensive if yields keep soaring. What does this mean to you as an investor? Well, plenty of tired, lazy, wet-behind-the-ears bulls will tell you that Europe’s struggles are exactly that — Europe’s struggles. Who cares! But that sounds like pure claptrap to me because the list of countries experiencing financial turmoil is getting longer every day. Argentina. Turkey. Brazil. Malaysia. Indonesia. Each and every one is seeing their currencies falling, their stock markets reeling, and their debt markets coming under pressure. Now the sickness has spread to Europe. If THAT’s not enough to concern you, then remember the point I’ve made repeatedly in the last several months. This isn’t just an emerging market debt problem, or a European debt problem. Those problems are just symptoms of the broader underlying sickness: The Everything Bubble that has infected so many corners of our financial system and so many different asset classes. In short, more and more markets are getting “sick.” And that’s why you need to seek out healthier investments. Investments like gold. It’s no coincidence to me that the yellow metal is holding its own around $1,300 an ounce despite one of the sharpest U.S. dollar rallies in ages. I believe investors are noticing that risk “flare ups” around the world are becoming both more common and more intense. What’s more, I don’t expect that to change. I think things are only going to get worse later in 2018 and 2019. That means more volatility, and more investors seeking out “chaos insurance” in the form of gold and gold mining stocks. One that I recommended recently in my Weiss Ratings’ Under-The-Radar Stocks service, for instance, is on fire. 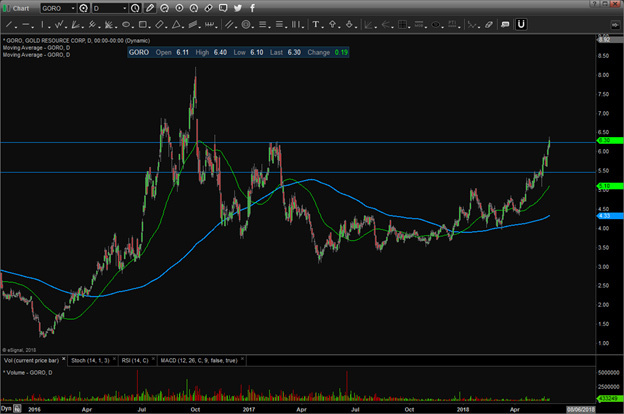 Look at this chart of Gold Resource Corp. (GORO) and you can see it carved out a nice rounded bottom. 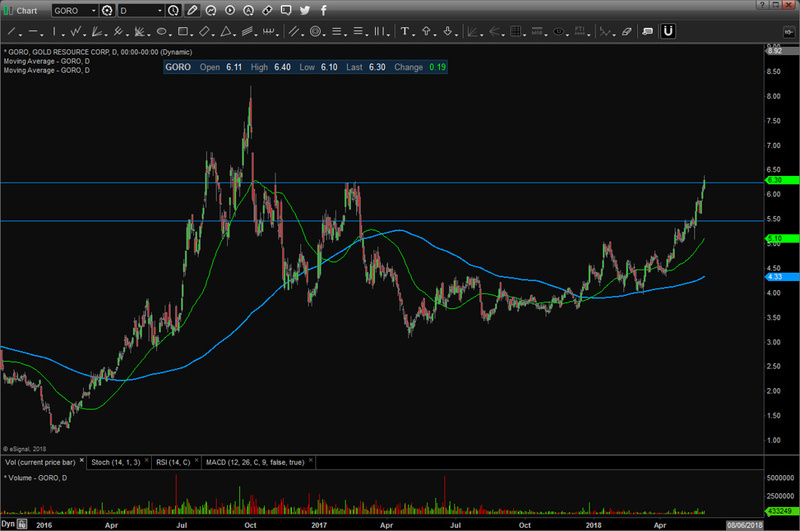 Then in the past few weeks, it blasted through overhead resistance at $5.50 and $6.20. If you want my recommendations on what to do with GORO now … or some of my other favorite stocks for this environment … give my customer service team a call at 1-877-934-7778 and they’ll get you set up with my newsletter. There’s a good chance I’ll have more metals-related recommendations in it given how the markets are shaping up! P.S. If you missed my presentation at the MoneyShow Las Vegas, you can access the archived video here. I will also be presenting at the upcoming San Francisco, Toronto, and Dallas events. You can find more information here. If those cities are more convenient to you. Hope to see you there! Sean: I would continue my subscription to your work just for the subtle? humor you inject into your writing if not for the information you impart. But I do have a question for you. Before you went on the cruise, you called the next wave of history the EV Wave. I believe it will be called the age of A I, artificial intelligence! A I will affect much more than EV’s., it will envelop everything. EV’s will be self directed, work will change for everyone and entertainment will be far different from what we experience today. A I will encompass everything. EV’s will get us to our destination, but A I will change the way we get there. But I am still wondering what will power EV’s. If it’s not going to be oil or coal, it could be nuclear ( go CCJ) or solar but we have to get cracking (horse and buggy term) If we need permits!